The fibula free flap provides a long, strong segment of bone for use in reconstructive surgery. It can be harvested as a purely osseus flap or can include a large fasciocutaneous component if needed. The pedicle runs the length of the fibula, with perforators extending to supply the skin paddle. To date, no other flap is capable of providing such a long segment of bone; up to 26 cm can be taken without affecting leg function. A segment of bone must be preserved distally, however, to support the ankle, and proximally to avoid injury to the peroneal nerve. Loss of tissue resulting from cancer ablation or debridement of infected tissues or secondary to trauma provides the reconstructive surgeon with various challenges. (See the first image below.) Defects of the head and neck may involve one or a number of tissues, including skin, cartilage, fascia, and bone. The idea of replacing “like with like” holds true in all facets of reconstructive surgery, but none so obviously as in the case of osseous defects. While reconstruction of soft-tissue defects may require a fasciocutaneous or musculocutaneous flap, composite tissue loss that includes bone should be managed with a flap that contains vascularized bone. (See the second image below). Complex defect involving anterior mandibular arch. The fibula free flap is well suited for anterior mandibular arch defects. The complete arch can be rebuilt following shaping of the bone. Unlike several other free flaps used for head and neck reconstruction, the fibula flap can be harvested simultaneously with the extirpation of the tumor by a second surgical team. Although literature shows that a reconstruction plate or miniplates may be used with equal efficacy in the flap procedure, we prefer to use a 2.0 microvascular reconstruction plate, which is contoured prior to tumor extirpation if possible. The leg wound can be closed primarily if the defect is small or no skin was harvested. More commonly, a split thickness skin graft is needed. Until the advent of free tissue transfer, reconstruction of mandible and midface defects was suboptimal. Anterior mandibular arch defects resulted in the so-called "Andy Gump" deformity, a term, coined in 1978 in a dental publication, that referred to the appearance of a chinless cartoon character from early in the 20th century. These patients not only had an obvious cosmetic deformity but also severe functional problems such as poor oral competence and drooling. 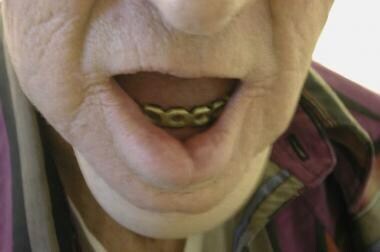 Patients with small lateral defects of the mandible had less severe problems, but they too had difficulties with chewing, swallowing, and speaking. Some surgeons addressed this problem by plating across defects with or without nonvascularized bone. However, this technique tended to eventually result in plate exposure, particularly in irradiated patients. (See the image below.) Bulky, pedicled flaps were also used to cover these plates, with improved but varying degrees of success. Patient with plate exposure after reconstruction of a mandibular defect without the use of an osteocutaneous flap. The fibula free flap was introduced in the mid-1970s for the reconstruction of tibial defects. Its use in mandibular reconstruction was first described in 1989, by Hidalgo, with fibular reconstruction now being the criterion standard for the reconstruction of mandibular and maxillary bony defects. The presence of endosteal and periosteal blood supplies to the bone allows for multiple osteotomies and therefore precise contouring to approximate the shape of the native mandible. Pedicle diameter allows relatively easy anastomoses; veins are 1.5-3 mm and the artery is 2.5-3.0 mm. One drawback is the relatively short pedicle length. Although its exact length depends on the amount of proximal bone discarded, it is generally 3-6 cm. Since its initial description as an osseus flap, the flap has been modified to include a cutaneous portion and has thereafter been described with a sensate paddle of skin. In the early 1990s, many surgeons were reluctant to use the osteocutaneous flap because of reported problems with vascular reliability of the skin. This resulted in some surgeons advocating that the flap be used only as an osseous flap. However, experience and an improved understanding of skin paddle anatomy have led to an improved ability to maintain the delicate perforators. Surgeons now realize that skin viability is more technique-dependent with this flap than in many other free flaps. Cutaneous perforators may be septocutaneous or musculocutaneous. Harvesting a piece of the Soleus muscle ensures adequate blood supply to the skin. Size of the skin paddle, whether to design the paddle proximally or distally, and use of a tourniquet are dictated by individual preferences and patient requirements. Preoperative evaluations in all patients should be done in conjunction with the ablative team. The extent of tumor,  presence of regional and distant metastases, bone involvement, and general medical condition are all factors that must be taken into consideration in order to determine a surgical plan. Special attention must be paid to the patient's dorsalis pedis and tibialis posterior pulses if a fibular flap is being considered. The feet and legs must also be assessed, for color, edema, scars, any signs of venous congestion, and/or any other abnormality. Dental, oral surgery, social work, and physical therapy consults should be obtained. In many cases, dental extraction is needed and can be done before or at the time of surgery. The fibular free flap is also an excellent choice for patients interested in having osseointegrated implants. These devices can be implanted in the flap when used for mandibular and maxillary reconstruction; however, such devices are very expensive and their cost is seldom covered by insurance. Patients with abnormal pedal pulses or abnormal skin texture should undergo further testing. The role of preoperative Doppler examination, angiographic imaging, or magnetic resonance angiography (MRA) to evaluate the vascular anatomy of the leg is undetermined. It is our practice to perform physical and Doppler examinations, reserving other techniques for use only as needed. An osteocutaneous flap can be harvested in patients who require soft-tissue coverage to replace intraoral or external skin defects. The skin of the flap is anchored to the bone by the septum, through which the septocutaneous perforators run. Thus, the skin paddle is only moldable to fit a two-dimensional defect. Three-dimensional defects require different reconstructive techniques. The volume of tissue that can be harvested is also limited, and some situations require a two flap technique or a different donor site. Three vessels provide the vascular supply to the lower leg. In the knee, the popliteal artery bifurcates into the anterior tibial artery and the tibioperoneal trunk. The latter divides into the posterior tibial artery and the peroneal artery. In the lower leg, the anterior tibial vessels lie on the dorsum of the foot and are palpable as the dorsalis pedis pulse. The posterior tibial vessels run deep in the leg along the lateral aspect and can be palpated as the posterior tibial pulse. The peroneal vessels lie in close proximity to the fibula, coursing the entire distance of the bone along its medial aspect. The artery is accompanied by paired venae comitantes, which may join together proximally. Although variations of the lower leg anatomy are uncommon, they are important to identify if a fibular free flap is planned. When a dominant peroneal artery exists, pedal circulation is more dependent on this vessel. Sacrifice of the peroneal artery in such cases renders the foot susceptible to ischemia when the fibula flap is harvested. Preservation of the peroneal nerve is important to avoid complications. It lies superficial to the upper lateral fibula and crosses the fibula about 3 cm distal to the proximal fibular head, where it is most susceptible to injury during bone harvest. To minimize risk, the superior 4-6 cm of fibular bone is preserved. Reinnervation of the cutaneous paddle is possible via the lateral sural cutaneous nerve, which can be traced medially when the soft tissue is harvested. However, the skin paddle may or may not actually be supplied by this nerve. The skin paddle is supplied by perforators from the peroneal vessels that enter the skin via the posterior crural septum, which is identified between the peroneus longus and soleus muscles. One to three perforators are identified for skin harvest. They can be identified preoperatively with duplex Doppler imaging or in the operating room before the incision is made with a hand-held Doppler unit. 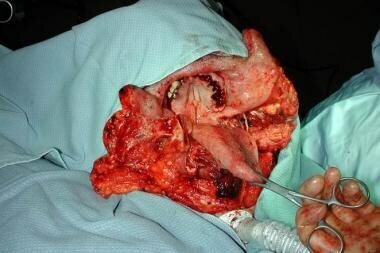 They should be directly visualized in the fasciocutaneous tissues of the septum during the dissection. Perforators may also be encountered coming directly from the muscle, which do not course through the septum. These may or may not originate from the peroneal vessels. Harvesting a cuff of soleus muscle may help to preserve these muscular perforators. The maximum density of perforating vessels in the leg appears to be in its proximal and distal aspect rather than in the midportion of the lower extremity. In deciding ideal placement of the skin paddle, the surgeon is typically limited by the need to harvest a pedicle of sufficient length; thus, distal harvest is usually chosen. The paddle is centered at the junction of the middle third and distal third of the fibula. Skin paddles have become increasingly reliable, probably owing to the harvesting of larger (longer) skin paddles, an increased understanding of perforating vessel anatomy, more reliable identification of perforating vessels, and more expert dissection of the septum. Trauma, tension, or injury to the septum may result in loss of the skin paddle because of perforator injury. 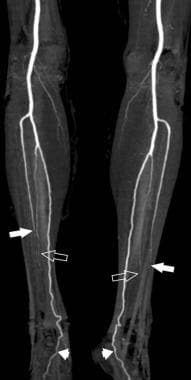 Abnormalities in vascular anatomy of the lower leg may preclude safe harvesting of the fibula. (See the images below.) Dominant peroneal circulation may be present in patients with congenital absence or underdevelopment of the anterior tibial vessels. An enlarged peroneal artery is known as peroneus magnus and is a major blood supply to the foot. Patients with peroneus magnus or impaired circulation to the leg should not undergo fibula transposition, due to risk of ischemic damage to the foot. Angiogram showing poor candidate for fibular flap. Solid arrow: anterior tibial artery. Hollow arrow: peroneal artery. Short arrow: plantar artery from posterior tibial artery. Patient with poor circulation to the lower leg following fibula free flap harvesting. Caution is advised in patients who have had extensive leg trauma or surgery prior to planning fibular surgery. 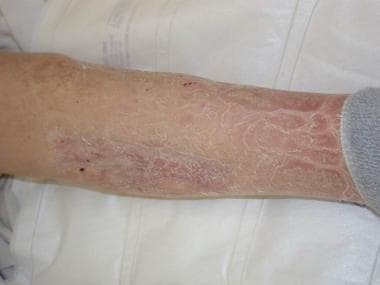 Diabetic patients are also poor candidates due to the risk of having significant venous stasis or peripheral edema, poor circulation or healing, and cutaneous ulcers. Alternatives include no reconstruction, plating only, an iliac crest or scapula flap, an osseocutaneous radial forearm flap, or soft-tissue coverage only. One should carefully evaluate the functional status of the patient, because he or she will have some temporary impairment following harvest. Although not contraindicated per se, patients with large bone and skin defects may require 2 flaps to properly reconstruct the defect. Some surgeons would choose another flap rather than using 2 free flaps. In these patients, a separate fasciocutaneous flap may be required to resurface the skin, especially if the skin defect is not in immediate proximity to the bony loss. The fasciocutaneous portion of the fibula flap limits its ability to conform to complex three-dimensional defects. Sun GH, Patil YJ, Harmych BM, Hom DB. Inpatients with gunshot wounds to the face. J Craniofac Surg. 2012 Jan. 23(1):e62-5. [Medline]. Okay D, Al Shetawi AH, Moubayed SP, Mourad M, Buchbinder D, Urken ML. Worldwide 10-Year Systematic Review of Treatment Trends in Fibula Free Flap for Mandibular Reconstruction. J Oral Maxillofac Surg. 2016 Jun 18. [Medline]. de la Parra M, Sanchez G, Lopez J, et al. Total maxillary reconstruction using a double-barreled and double skin paddle fibular flap after total maxillectomy. Arch Plast Surg. 2013 Nov. 40(6):779-82. [Medline]. van Gemert JT, van Es RJ, Rosenberg AJ, et al. 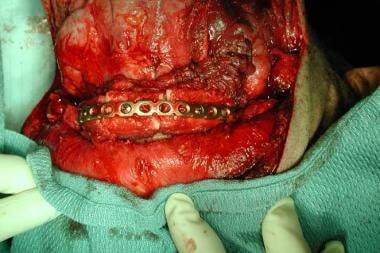 Free vascularized flaps for reconstruction of the mandible: complications, success, and dental rehabilitation. J Oral Maxillofac Surg. 2012 Jul. 70(7):1692-8. [Medline]. Toto JM, Chang EI, Agag R, et al. Improved Operative Efficiency of Free Fibula Flap Mandible Reconstruction with Patient-Specific, Computer-Guided Preoperative Planning. Head Neck. 2014 Jun 21. [Medline]. Thankappan K, Trivedi NP, Subash P, et al. Three-dimensional computed tomography-based contouring of a free fibula bone graft for mandibular reconstruction. J Oral Maxillofac Surg. 2008 Oct. 66(10):2185-92. [Medline]. Miller ME, Moriarty JM, Blackwell KE, Finn JP, Yiee JH, Nabili V. Preoperative magnetic resonance angiography detection of septocutaneous perforators in fibula free flap transfer. Arch Facial Plast Surg. 2011 Jan-Feb. 13(1):36-40. [Medline]. Wax MK. The role of the implantable Doppler probe in free flap surgery. Laryngoscope. 2014 Mar. 124 Suppl 1:S1-12. [Medline]. Al-Bustani S, Austin GK, Ambrose EC, Miller J, Hackman TG, Halvorson EG. Miniplates Versus Reconstruction Bars for Oncologic Free Fibula Flap Mandible Reconstruction. Ann Plast Surg. 2016 Sep. 77 (3):314-7. [Medline]. Pellegrino G, Tarsitano A, Ferri A, Corinaldesi G, Bianchi A, Marchetti C. Long-term results of osseointegrated implant-based dental rehabilitation in oncology patients reconstructed with a fibula free flap. Clin Implant Dent Relat Res. 2018 Aug 24. [Medline]. Fibula harvest following osteotomies. After complete dissection of the pedicle and preparation of the recipient site, the pedicle is transected. Following harvest, the proximal bone is trimmed and osteotomies are performed if necessary. The reconstruction plate is used as a template for shaping the bone. Patient with osseointegrated implants in flap. The authors and editors of Medscape Drugs & Diseases wish to thank Catherine P Winslow, MD, Consulting Surgeon, Winslow Facial Plastic Surgery, LLC, for her previous contributions to this article.